Writing in Girlhood Embroidery: American Samplers & Pictorial Needlework 1650 – 1850, vol. I, Betty Ring states that the majority of early 19th century mourning silk embroideries “appear to have been made as a record and a decoration rather than an expression of current grief, and they were the result of fashion rather than melancholy.” These mourning pictures generally focus on a specific person, recently deceased, and the most interesting ones feature a stylishly costumed young lady, likely a portrait of the needleworker herself. 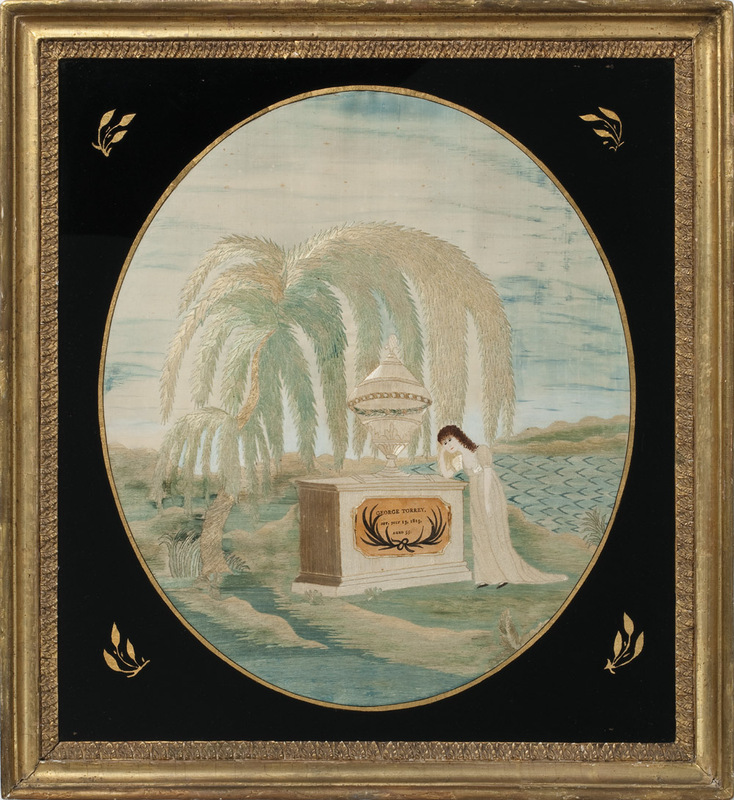 The subject of this praiseworthy memorial is George Torrey of Scituate, Massachusetts, who died on July 13, 1813, at the age of 55, as is written in ink on the tomb of this silk embroidery. Specific information about George is documented in The Torrey Families and their Children in America, vol. I, by Frederic C. Torrey, A. M. (Lakehurst, NJ, 1924). He was born on January 19, 1758, as the last of the eight children of Capt. Caleb Torrey, a tavern owner, and his second wife Mary (Clap) Torrey. George was a ship builder and remained in Scituate his entire life. He married Thankful Otis in 1782, also of Scituate, and they had eight children. We can presume that this silk embroidery was made by one of the younger daughters of George and Thankful. There is a fine quietude to this piece. A leafy willow with a twisted trunk hangs heavy over the memorial, with its monumental urn atop and mourning girl, and alongside a rippling blue river or pond. Rolling green hills are set in the distance. The painting of the face of the young lady in mourning is extremely fine, and wonderfully evocative. Worked in silk and watercolor on silk, this embroidery is in excellent condition. Importantly, it remains in its original frame and with its original eglomisé glass.